What Do Bees Do in February? What happens to the bees in the winter? 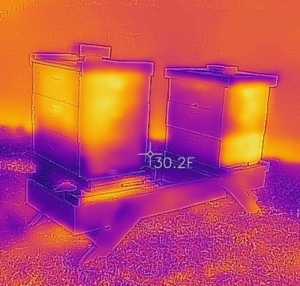 A thermal camera image of 2 hives in February, each with three medium 10-frame boxes. The bright yellow areas show the general area of adult bees and the brood nest. This goes to who that these hives are building their population quickly, but still do not keep the entire hive warm. They only work to keep themselves and the brood nest warm. What are beekeepers doing in February? 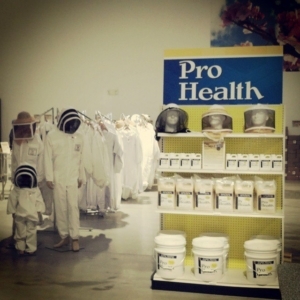 March is the month when a lot of beekeepers receive their purchased bees, so don’t get caught off guard when they come. Take the time you have during February to make those “last-minute” preparations. This is a great time to prepare new locations for bees by leveling off ground and setting up hive stands. 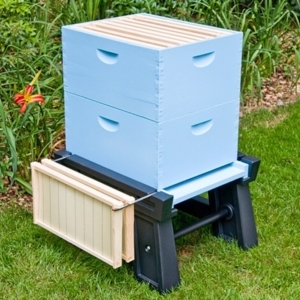 Hive stands can be as simple as cinder blocks or as complex as a purpose-built structure set in concrete. No matter how you set up your new location, it’s easier before bees arrive. February is a good time to adjust existing hive stands. Did the grass grow up too high around the hives last year? If so, you can put weed blocker down now or even asphalt shingles to keep the grass down. Don’t forget that the bees need a place to live. If you don’t have the equipment yet, check out our website here to see if we can help. We can paint and/or assembled equipment for you as well to save time. If you already have the equipment, now is the time to assemble or to give the paint touch up. You can even paint the hives that have bees in them on days below 55°. Usually, after some time in service, most equipment needs a touch up here and there. Swarm lists are usually posted by many beekeeping clubs. If you are interested in wrangling some bees from a neighbors yard, add your name to your clubs swarm list and you will likely get a call this spring. Be prepared though, as swarms don’t wait for you to get your swarm catching equipment together. When it’s a warm day, preferably at the beginning of a warm spell, you can take a peek at your bees. Don’t rifle through every frame in the hive, just take a look from the top down. Usually, you can look down through every frame in the hive if you just take the inner cover off. The hive will just be lightest it will be all year, so give it a heft on the back to see how heavy it is. If you do this throughout the year, you can start gaining some muscle memory on how much honey is inside the hive. What is coming up in beekeeping in March? March is a big month for bees. Bees starting thinking about swarming in early March and are well on their way to swarming by late March. Massive bee population expansions happen in March and you start to get the earliest glimpses of flower blooms. Tie up your bee boots folks, cause March is when things start to pick up for the bees.